The scariest news this Halloween involves the continued delay of a first-rate independent space program. 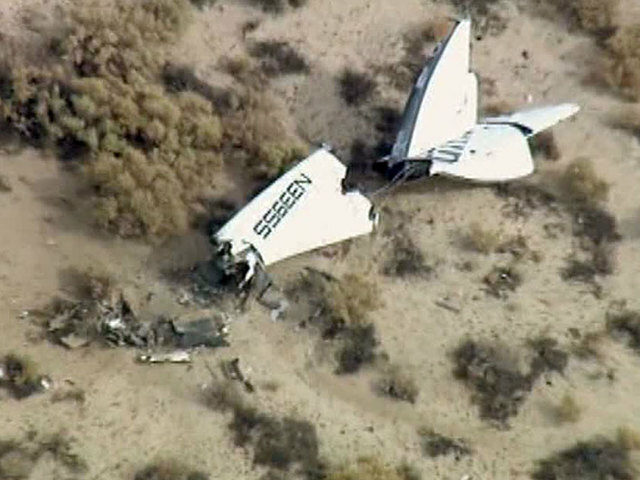 Virgin Galactic's premiere tourist spacecraft, SpaceShipTwo, crashed today in the Mojave desert during a test flight. According to the LA Times, the WhiteKnightTwo airplane, which carries the spacecraft, landed safely after a "serious anomaly" caused the crash. One pilot is dead, while another successfully parachuted from the flight. The SpaceShipTwo was thought to be an attractive option for space tourism, with Virgin Galactic founder Richard Branson enthusiastic about being "on the verge" of initiating commercial space travel. Tickets for $250,000 were to ferry passengers to the edge of space, riding 50,000 feet up via the WhiteKnight plane before disengaging with SpaceShipTwo. The spaceship would then travel at 2,500 miles per hour, toting a pilot and six passengers to the upper atmosphere, around 60 miles up. SpaceShipTwo and WhiteKnightTwo, in better times. One possibility for the anomaly, according to NBC News, is that Virgin Galactic has switched the fuel for the aircraft in the nine months since their last test flight. SpaceShipTwo's rubber-based fuel compound was traded for a plastic-based fuel that was thought to be able to improve the hybrid engine's function. Earthlings, have a safe Halloween, and don't be too haunted by the failures that must occur on the path of progress. You need to explore best tutorials on reverse cellphone lookup free with name and all the related topics.